Garden Decor. Having a dream is the nicest thing ever. You get excited about some idea, you think how to realize it, how to achieve something and get right to the point. On the way to realizing the dream, one can access some barriers, problems, issues that won’t like and maybe would hesitate him or her to go through the goal. But, that’s why, when the end comes, the happiness is limitless. Patricia finally succeeds to buy the house of her dreams. It is a big house with even bigger yard. Almost all of her savings Patricia has spent on her house and now unfortunately she doesn’t have enough assets to arrange her yard. Together with her friend David and our player they will have to find well hidden objects and that way to earn money so they can buy new things for her garden, and Patricia’s biggest wish is to build huge pool. But, she needs the most money for that. Let’s help Patricia build the garden of her dreams! Money can’t always solve our problems, but very often they actually can. If you help this lady find what she needs, she will create the best garden you have ever seen! 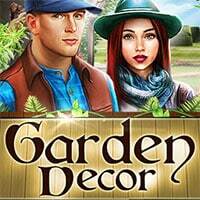 Garden Decor is a free online hidden object game on Hidden4Fun.